Greenleaf Book Group Press, 9781608322770, 180pp. Many small business owners feel pressure to discount their products and services, especially when times are tough. After all, how else will they keep up with the low prices offered by their discounting competitors? What they don t realize is that discounting is the last thing they should be doing if they want to win big. one in which the owners focus on creating specialized offerings and an over-the-top customer experience, not on matching the prices of their competition. Worth Every Penny encourages you to explore and use this model, which is designed to maximize your advantages over the big-box stores and other discounting competitors. Build a brand that lays the foundation for you to charge what your offerings are worth. Create products, services and high-touch customer experiences to achieve healthy margins and an outspokenly happy and loyal client base. Understand how to use a pricing strategy that allows you to create demand and attract the right customers instead of discounting. Throw traditional advertising to the wind and implement a boutique way of marketing to excel in this competitive business environment. Learn the relationship-based sales skills needed to close every sale and have your clients clamoring for more. The authors strategies are enhanced by real-life business experiences and vivid anecdotes from all types of business owners restaurateurs to contractors to professional service providers and photographers. 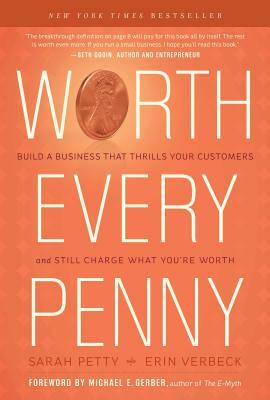 With the advice in Worth Every Penny, you will be inspired to live your passion and pass your enthusiasm on to your customers. The result: a profitable business that avoids succumbing to the pressure to discount. Sarah Petty is the founder of The Joy of Marketing, where she and her team teach small business owners how to charge what they are worth. Petty began her career in the marketing department at the world s largest brand, Coca-Cola Enterprises, and went on to direct the marketing campaigns of many small businesses at a top regional advertising agency. After earning her MBA, Petty opened her boutique photography studio and was named one of the most profitable photography businesses in the country after just five years in business by the Professional Photographers of America. Petty is also a sought-after speaker, presenting to audiences around the globe on how the boutique business model can strengthen their companies. Erin Verbeck is the Chief Joy Officer at The Joy of Marketing. After developing marketing plans for small business owners in the tourism, beauty, retail, and restaurant industries at a top regional advertising agency, Verbeck went on to earn her MBA from Texas Christian University. She directed the branding and marketing of a handful of the travel industry s top brands at Sabre Travel Network, the parent company of Travelocity, before joining The Joy of Marketing. Verbeck has been featured as a contributor to the Wall Street Journal radio network and The American Express Open Forum as an expert on small business branding and marketing issues.